Blog # 2 on the Power of the Creative Imagination. The Inner Critic usually develops in our childhood, originally as a protective mechanism. The I.C. starts out wanting to make sure we look both ways before crossing the street, or not touching a hot stove. And, let me be absolutely clear about this: I’m not blaming Mom or Dad. The I.C. can come from anyplace; being horrible at kickball on the playground, feeling vulnerable, scared, frightened, or not up to snuff according to society, organized religion, or any authority figure that terrorize our tender minds. Sadly, at some point the I.C. spirals out of control and we give up. Kaput. A wet blanket smothers the fire in our bellies. And as we believe the I.C. is telling us the truth, we sink further into the bottom of an ice cream container at 2 AM. My I.C. 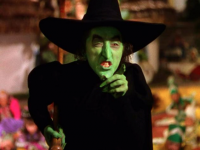 is the Wicked Witch of the West (WWW). She shakes her finger at me, locks me in her castle, threatens my Toto, and sends flying monkeys at midnight which in turn, sends me directly to the nearest Ben and Jerry’s Rocky Road, spoon in hand. Keep this image of the WWW in mind; I’ll return to it later. Yet, there is hope. While we can never get rid of the I.C., we can use imagery to quiet it’s grumblings. As we become aware of and realize the I.C. is not our authentic Self, we learn to listen to it’s concerns and say “Thanks for pointing that out to me. I’m not a child anymore and I’ve got everything under control. You can go take a walk now.” Quieting the I.C. helps us get out of our heads, back in tune with our bodies, and allows us to break from the constant negativity that runs around unchecked. Over the course of the next ten days, every time you feel grumblings from your I.C., remember, it’s not the truth. Begin to distance yourself from it’s criticisms and be open to an antidote image coming into your mind that transforms the I.C. into an ally. This ally will help you look both ways before crossing the street while paying no mind to that man behind the curtain pulling all the whistles, tricks and fireworks that scare us.